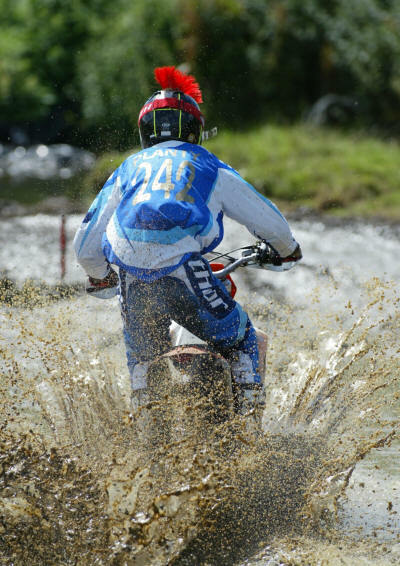 Race report by Gareth Hampson. July 13th saw the welcome return to the ever popular College Farm at Woodend. 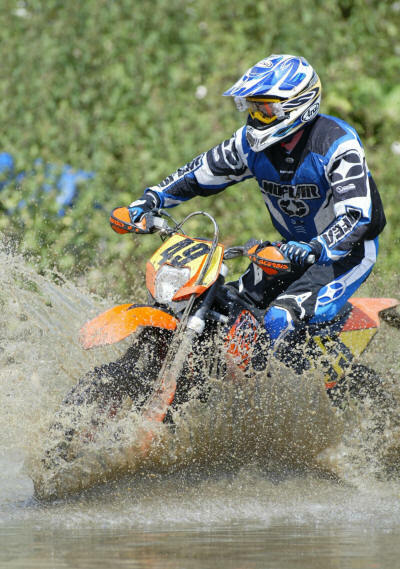 Continuous rain the week before prompted many riders to invest in a new rear tyre. Despite the low turn out at the working party, a challenging course was set out that provided a fast and at times tricky lap, making maximum use of what is a fairly noise sensitive venue. Signing on and scrutineering were carried out quickly and efficiently, leaving plenty of time to enjoy the warm and sunny weather that looked to be set for the day. 62 riders took the start. They were given 5 minutes to warm their engines prior to the start. In the blink of an eye Giles’s kitchen clock struck 11:00 am and the first row was away. Most riders started on their minute, Nigel Forester’s CZ was reluctant to start – perhaps it was the prospect of the infamous Woodend railway embankment, the CZ being old enough to know better! 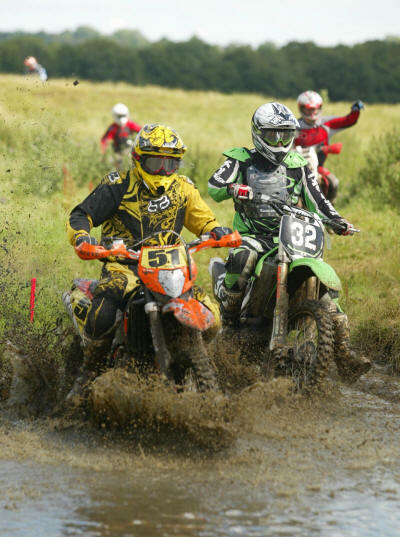 First up was a series of fast bends and a jump, the riders then had to negotiate a slippery gateway into the next field. The quick lads had an early chance to practice their ditch jumping technique over a handily placed jump. The track then continued around the edge of the field, through a ditch into another set of fast bends. 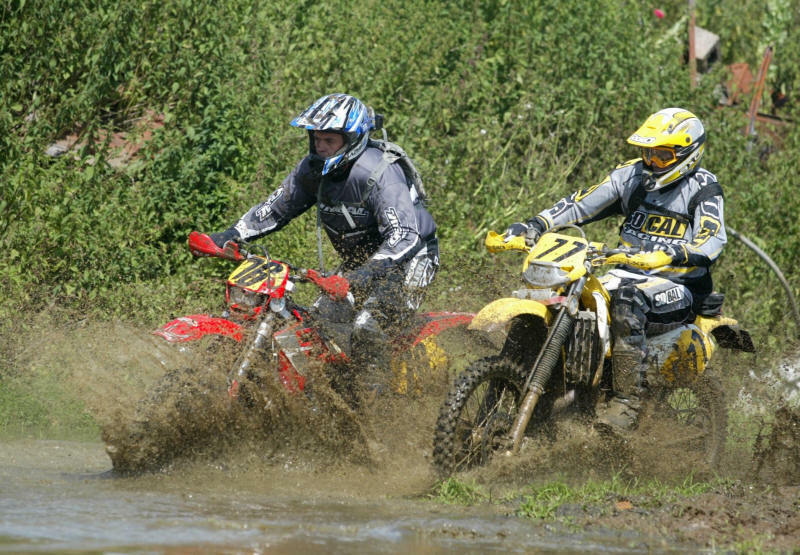 Then came the first test of skill and commitment – a heavily rooted deep ditch that was to claim several riders over the 3 hours. Following this there was a quick blast across a soggy field, through a gap in the hedge onto some more sweeping bends which all too quickly brought the riders to the trickiest part of the lap. Although always rideable, the embankment punished riders with too little commitment and ensured the marshals were kept busy most of the day. Once at the top the riders threaded their way along a quick and bumpy track. Martin Rushbrook decided to park up at a tree – literally! Hope you are feeling a little better. The descent from the embankment lead to another ditch that was easily jumped, whisking the riders ever closer to the Woodend Bog which also claimed its fair share of riders. Next up was the quarry with a stinking water crossing! The climb out was short, off camber and slippery, perfect for catching out the unwary. Another fast section led to some high speed bumps and the end of the lap. Several riders suffered punctures, proving the worth of ultra expensive mooses – although a moose can’t stop gearbox trouble as I found out the hard way, annoying after a good first half. Still, it made me available to drag bikes and riders up the embankment! In the experts Michael Ridge completed 29 laps, 1 ahead of Ryan Griffiths who had suffered a puncture 45 minutes in. David Frankland was 3rd. Clubman Enduro saw James plant take 1st, John Abbott was 2nd Steve Potter in 3rd. Robert Dowie won the Sportsman Enduro class. The Clubman Motocross class was closely fought all day, Jon Gutteridge tied with Geoff Mayes for the overall win, despite losing time searching for his missing lap scoring tag. Scott Stevens finished 3rd. 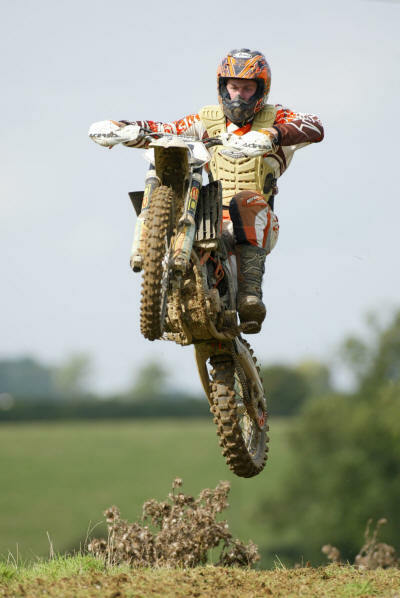 Barry Swain took a well deserved win in the Sportsman Motocross class, proving that a late night drive from Leeds did not hamper his performance too much. Well done to Giles, this was his first Hare and Hounds as Clerk of the Course, an event that was a big hit with the riders. Thanks to all who entered, organised or helped. In the event of a points tie, overall race times were used to determine positions where possible.